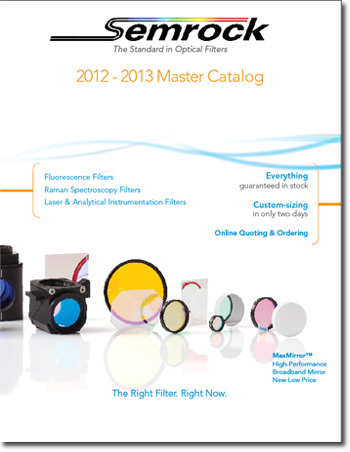 Rochester, NY, - Semrock, Inc. announced the release of its new 112-page, full-color, 2012-13 Master Catalog of optical filters and related products. This comprehensive catalog contains several new Technical and Product Notes along with a larger than usual selection of new products introduced in the past six months. Over 35 new thin-film filters for fluorescence microscopy and measurements, Raman spectroscopy, and other laser analytical instrumentation applications, as well as many improved versions of existing optical filters and sets are available. Among the standouts of this print edition are, the new Semrock PulseLine™ family of optics that are specifically designed for femtosecond pulsed laser applications. The initial product offering consists of three high reflectivity mirrors optimized to steer beam pulses within the tuning range of a Ti:S ultrafast laser for near-normal incidence and at 45degrees. All products are optimized for low group delay dispersion and are available from stock for same day shipping. After first introducing the MaxMirror ultra-broad mirror nearly 10 years ago, Semrock has combined the latest coating technology, manufacturing capabilities, and Semrock's extensive knowledge of thin-film coatings to lower the price to $99 a mirror, or purchase a 10-pack for additional savings and a free gift. This award-winning mirror’s performance hasn’t been compromised – it still maintains the same high laser damage threshold, average reflectivity of greater than 98% over the 350-1100 nm range, and now boasts a 10-5 Scratch-Dig cosmetic specification and a thinner substrate thickness of 6 mm. Semrock continues to improve current product lines by now offering single-band and single-edge laser sets with an extended reflection dichroic beamsplitter, also offered individually. With reflection down to 350 nm, these laser sets are ideal for the latest cutting-edge applications such as uncaging and photoactivation. And with a steeper edge, these dichroic beamsplitters can allow for capturing more fluorescence signal for even the tightest spaced absorption & emission fluorophore spectra. Exceptional Semrock services highlighted in the catalog include our same-day shipping policy, 2-day custom-sizing, and a 30-day no-hassle return policy. All Semrock filters are covered under the company’s five-year warranty. Semrock, Inc., a Unit of IDEX Corporation, manufactures optical filters that set the standard in performance and reliability for the biotech and analytical instrumentation industries, as well as innovative optical filters for more general laser and optical systems applications. All Semrock optical filters are made with hard ion-beam-sputtered optical coatings. OEM filters are manufactured in volume. End-users benefit from a wide selection of standard catalog products that ship from stock. Semrock’s patented and patent-pending products include its highly acclaimed BrightLine® fluorescence filters, state-of-the-art filters for Raman spectroscopy, and other unique filters for lasers and optical systems. Semrock’s innovative products, made possible by combining modern ion-beam sputtering with Semrock’s proprietary volume manufacturing technology, are covered under a five-year warranty. Founded in September 2000, Semrock is based in Rochester, New York, a well-known center of optics, and has sales offices throughout the United States. In October 2008 Semrock became a Unit of IDEX Corporation.